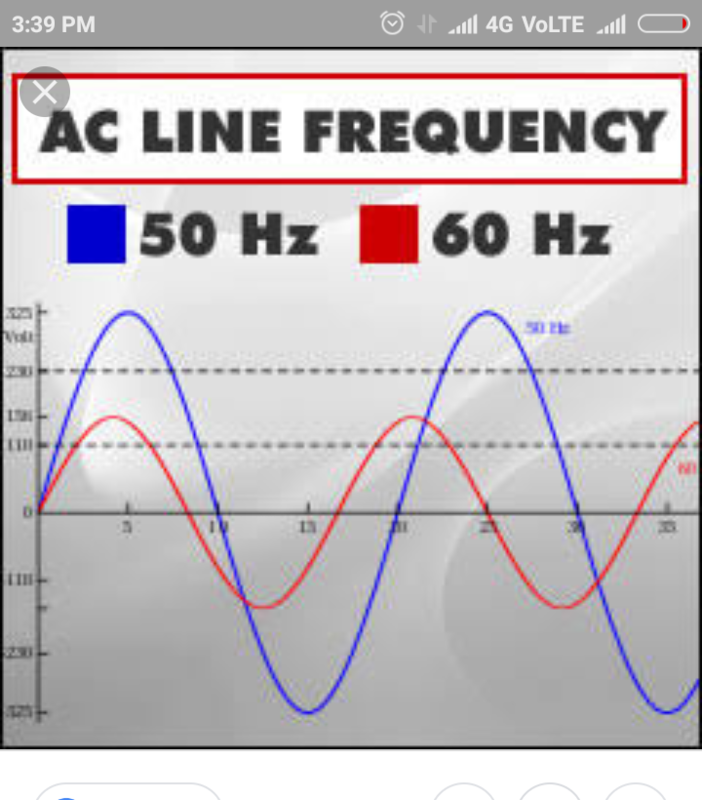 In this article we will learn about the main difference between 50 HZ and 60 HZ frequency system .we will know that what is 50 hz and 60 hz frequency stsSys. Difference between 50 HZ and 60 Hz frequency System. We all know that in india power is distributed with 50Hz frequency and some countries like USA, canada, arentina etc. Why some countries use 60 HZ and some are 50 HZ , we know about it from some differences. A basic difference is that 60 Hz frequency is 20% higher than 50Hz. So that it affects on motor speed directly by 20%. It means for 50Hz motor speed is 1500 RPM then for 60Hz motor speed will be 1800 RPM. In lower frequency iron and eddy current losses is higher. And on lower frequency speed will be less.systems usually use 110V (120V) or thereabouts for the domestic power supply, while 50Hz systems tend to use 220V, 230V etc. for different countries. This has the impact that house wiring needs to be twice the cross section for the 110V system for the same power. Some conventional differences between 50HZ and 60 HZ frequency System. 1) With 60Hz, the transformers can be smaller and less expensive than for a 50Hz transformer. 2) with 60Hz results in less flicker on lamps as compared to 50 HZ, but that really is not a factor these days. 3) humming and its frequency noise is more with 60 HZ but less in 50 HZ. 4) Although 50Hz transformers require more copper and iron, 60Hz transformers require more expensive plates to prevent eddy current losses. 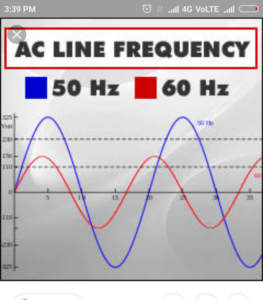 It is basic difference between 50HZ and 60hz frequently system. 5) Due to increased frequency, we can expect a slightly reduced power factor of motor at nominal current. 6) rated torque is largely proportional to the primary current, for the same slip, but there will be little or no difference for motors. Hence these are basic difference between 50HZ and 60HZ frequency. If you will find any incorrect in above article please comment below in comment box.